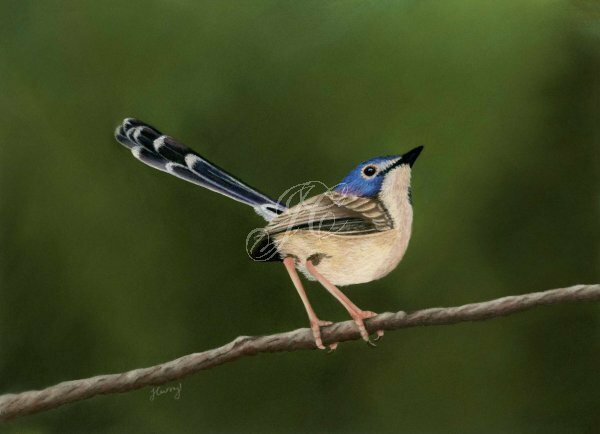 This is the 12th painting in my "Fairy Wrens of Australia" series, it features a female Lovely Fairy wren perched on a branch. Lovely Fairy wrens (Malurus Amabilis) are commonly found in Northeastern Australia in tropical and subtropical areas of dry forest or moist lowland forest areas. They belong to a group of four very similar species of fairy wrens known collectively as Chestnut-Shouldered fairy wrens, the other three species that make up this group are variegated fairy wren, red winged fairy wren and the blue-breasted. Original pastel painting created using artist quality Pastel Pencils and Soft Pastels on Clairefontaine Pastelmat. Reference photo by Dan Armbrust. Size is 25 x 17.5 cm. Fine Art Giclee Prints are also available in a range of sizes.